"COCl2" redirects here. For the compound CoCl2, see Cobalt(II) chloride. Not to be confused with phosphine, phosphene, oxalyl chloride, or phosgene oxime. Phosgene is the chemical compound with the formula COCl2. This colorless gas gained infamy as a chemical weapon during World War I where it was responsible for about 85% of the 100,000 deaths caused by chemical weapons. It is also a valued industrial reagent and building block in synthesis of pharmaceuticals and other organic compounds. In low concentrations, its odor resembles freshly cut hay or grass. In addition to its industrial production, small amounts occur from the breakdown and the combustion of organochlorine compounds, such as those used in refrigeration systems. The chemical was named by combining the Greek words "phos" (meaning light) and "genesis" (birth); it does not mean it contains any phosphorus (cf. phosphine). Phosgene is a planar molecule as predicted by VSEPR theory. The C=O distance is 1.18 Å, the C—Cl distance is 1.74 Å and the Cl—C—Cl angle is 111.8°. It is one of the simplest acid chlorides, being formally derived from carbonic acid. The reaction is exothermic, therefore the reactor must be cooled. Typically, the reaction is conducted between 50 and 150 °C. Above 200 °C, phosgene reverts to carbon monoxide and chlorine, Keq (300K) = 0.05. World production of this compound was estimated to be 2.74 million tonnes in 1989. Because of safety issues, phosgene is often produced and consumed within the same plant, and extraordinary measures are made to contain this toxic gas. It is listed on schedule 3 of the Chemical Weapons Convention: All production sites manufacturing more than 30 tonnes per year must be declared to the OPCW. Although less dangerous than many other chemical weapons, such as sarin, phosgene is still regarded as a viable chemical warfare agent because it is so easy to manufacture when compared to the production requirements of more technically advanced chemical weapons such as the first-generation nerve agent tabun. Upon ultraviolet (UV) radiation in the presence of oxygen, chloroform slowly converts into phosgene by a radical reaction. To suppress this photodegradation, chloroform is often stored in brown-tinted glass containers. Chlorinated compounds used to remove oil from metals, such as automotive brake cleaners, are converted to phosgene by the UV rays of arc welding processes. Phosgene may also be produced during testing for leaks of older-style refrigerant gases. Chloromethanes (R12, R22 and others) were formerly leak-tested in situ by employing a small gas torch (propane, butane or propylene gas) with a sniffer tube and a copper reaction plate in the flame nozzle of the torch. If any refrigerant gas was leaking from a pipe or joint, the gas would be sucked into the flame via the sniffer tube and would cause a colour change of the gas flame to a bright greenish blue. In the process, phosgene gas would be created due to the thermal reaction. No valid statistics are available, but anecdotal reports suggest that numerous refrigeration technicians suffered the effects of phosgene poisoning due to their ignorance of the toxicity of phosgene, produced during such leak testing. Electronic sensing of refrigerant gases phased out the use of flame testing for leaks in the 1980s. Similarly, phosgene poisoning is a consideration for people fighting fires that are occurring in the vicinity of freon refrigeration equipment, smoking in the vicinity of a freon leak, or fighting fires using halon or halotron. The great majority of phosgene is used in the production of isocyanates, the most important being toluene diisocyanate (TDI) and methylene diphenyl diisocyanate (MDI). These two isocyanates are precursors to polyurethanes. Phosgene was synthesized by the Cornish chemist John Davy (1790–1868) in 1812 by exposing a mixture of carbon monoxide and chlorine to sunlight. He named it "phosgene" in reference of the use of light to promote the reaction; from Greek, phos (light) and gene (born). It gradually became important in the chemical industry as the 19th century progressed, particularly in dye manufacturing. Following the extensive use of phosgene gas in combat during World War I, it was stockpiled by various countries as part of their secret chemical weapons programs. In May 1928, eleven tons of phosgene escaped from a war surplus store in central Hamburg. Three hundred people were poisoned of whom 10 died. 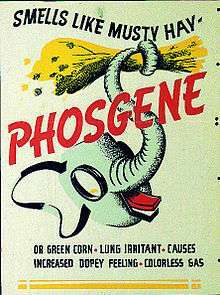 Phosgene was then only frequently used by the Imperial Japanese Army against the Chinese during the Second Sino-Japanese War. Gas weapons, such as phosgene, were produced by Unit 731 and authorized by specific orders given by Hirohito (Emperor Showa) himself, transmitted by the chief of staff of the army. For example, the Emperor authorized the use of toxic gas on 375 separate occasions during the Battle of Wuhan from August to October 1938. Phosgene is an insidious poison as the odor may not be noticed and symptoms may be slow to appear. The odor detection threshold for phosgene is 0.4 ppm, four times the threshold limit value. Its high toxicity arises from the action of the phosgene on the proteins in the pulmonary alveoli, the site of gas exchange: their damage disrupts the blood–air barrier, causing suffocation. It reacts with the amines of the proteins, causing crosslinking by formation of urea-like linkages, in accord with the reactions discussed above. Phosgene detection badges are worn by those at risk of exposure. ↑ Nomenclature of Organic Chemistry : IUPAC Recommendations and Preferred Names 2013 (Blue Book). Cambridge: The Royal Society of Chemistry. 2014. p. 798. doi:10.1039/9781849733069-FP001. ISBN 978-0-85404-182-4. 1 2 3 4 5 "NIOSH Pocket Guide to Chemical Hazards #0504". National Institute for Occupational Safety and Health (NIOSH). 1 2 "Phosgene". Immediately Dangerous to Life and Health. National Institute for Occupational Safety and Health (NIOSH). ↑ Nakata, M.; Kohata, K.; Fukuyama, T.; Kuchitsu, K. (1980). "Molecular Structure of Phosgene as Studied by Gas Electron Diffraction and Microwave Spectroscopy. The rz Structure and Isotope Effect". Journal of Molecular Spectroscopy. 83: 105–117. doi:10.1016/0022-2852(80)90314-8. ↑ "Common Cleaners Can Turn Into Poison Gas". American Iron Magazine. TAM Communications. Retrieved 14 October 2011. ↑ John Davy (1812). "On a Gaseous Compound of Carbonic Oxide and Chlorine". Philosophical Transactions of the Royal Society of London. 102: 144–151. doi:10.1098/rstl.1812.0008. JSTOR 107310. 1 2 Ryan, T.Anthony (1996). Phosgene and Related Carbonyl Halides. Elsevier. pp. 154–155. ISBN 0444824456. ↑ Borak J.; Diller W. F. (2001). "Phosgene exposure: mechanisms of injury and treatment strategies". Journal of Occupational and Environmental Medicine. 43 (2): 110–9. doi:10.1097/00043764-200102000-00008. PMID 11227628. ↑ "Phosgene: Health and Safety Guide". International Programme on Chemical Safety. 1998.